Usain Bolt won his second consecutive gold medal in the Olympic 100m final on Sunday, but he's already back to talking about his desire to pursue a new challenge in a different sport. He's said it before and now he's saying it again: he wants to play for Manchester United. 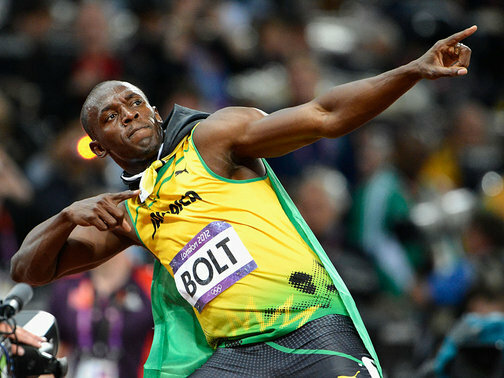 The Sun quotes Bolt as saying: "People think I am joking. But if Alex Ferguson called me up and said, 'OK let's do this, come and have a trial', it would be impossible for me to say no. "I would not take up the challenge if I didn't think I was good enough. I am a very accomplished player and know I could make a difference. "I would be the fastest player in the team — but I can play as well." The 6ft 5in Jamaican added: "I am in Britain for a few more days. If Alex Ferguson wants to give me a call he knows where I am." People might think he's joking because a video he released through his official YouTube channel for Manchester United manager Sir Alex Ferguson before the Olympics carried the line, "as an avid Manchester United fan he jokingly pleas for Alex Ferguson to sign him up" in its description. The video shows Bolt playing in an amateur match back home in Jamaica, supposedly against his coach's wishes. The 25-year-old sprinter has previously said that he played as a midfielder in high school. This isn't the first time Bolt, who visited United in 2009, has declared his interest in playing for the Premier League's most successful club, though. In his 2010 autobiography, Bolt said: "Ideally, if I was to play football, I'd sign for my favourite team - Manchester United. People say it's not realistic but nobody has seen me play so you never know. If Alex Ferguson saw me in one of those charity matches he might think I could replace Ryan Giggs." There isn't much in the video to make Sir Alex force out veteran Giggs just yet, but United are coming off a season during which they won just the Community Shield and giving one of the world's most popular athletes a trial while he happens to be in the country cannot hurt.